SharpKeys is registry hack that is used to manage an internal Windows setting to map one key to another. It uses no extra resources so it loads no drivers, and simply manages an existing function with a convenient UI. Windows 2000 and newer are supported; the 4.0 version of the .NET Framework is required! Edge with no tabs is an Edge extension that will take any newly opened tab and push it out to a standalone window. The purpose of this is for people that hate tabs – like me – and always want new pages to open in a completely independent Edge window. Shuffle By Album Free is an ad-funded free application that randomly selects an album, plays the entire album, and then randomly selects another album to play. Shuffle By Album is a simple ad-free application that randomly selects an album, plays the entire album, and then randomly selects another album to play. SharpMT is an offline Blog writer that is designed for MovableType based systems. It builds on the foundation of the first versions of SharpMT and adds new features that include proxy server support, custom tag integration, better support for Blog Links, an updated user interface, and built in spell checking. SharpMT 2.1, and higher, ships with a US-English version of a Spell Checker, but it is extendable to include Canadian English and UK English. Download the Dictionary packs and unzip them into your SharpMT working directory and the next time you start SharpMT you will see two new options for these dictionaries in the Spell Check Options dialog. For more information on the installation process, please read the ReadMe.txt that comes in the ZIP file. 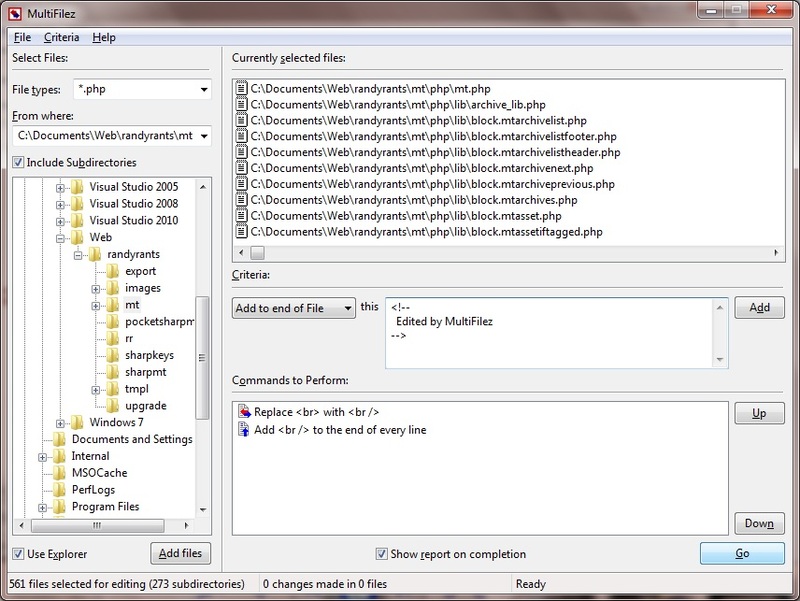 MultiFilez is a great tool for managing website files! 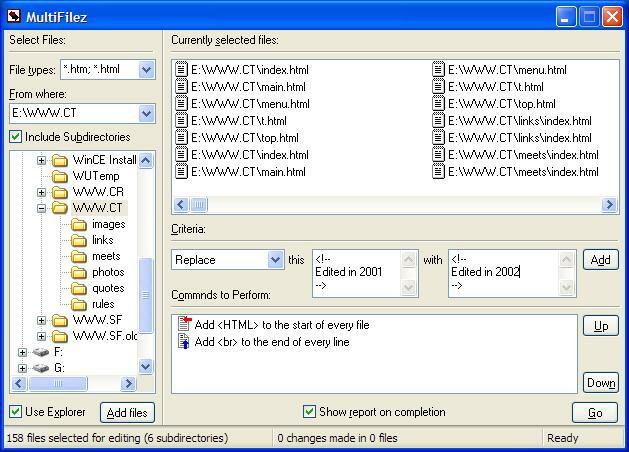 You can automatically edit multiple files, across multiple directories, based off a list of criteria. MultiFilez allows you to find and replace text, insert before the start or append to the end of every line, and add text to the start or end of any text-based files. Wildcards are supported when building a files list, using our unique graphical interface. Reporting at the end of each editing session is also available. 2.1 update includes support for larger displays and better UI support; for Windows XP or higher. MultiFilez is a great tool for managing website files! You can automatically edit multiple files, across multiple directories, based off a list of criteria. MultiFilez allows you to find and replace text, insert before the start or append to the end of every line, and add text to the start or end of any text-based files. Wildcards are supported when building a files list, using our unique graphical interface. Reporting at the end of each editing session is also available. Originally designed for Windows 95, this version supports smaller resolution displays and older versions of Windows. MultiPagez is a great tool for managing website structures! MultiPagez allows you to view an entire website at the same time. Using our multithreaded technology, entire websites are navigated and tagged in a matter of moments. The hierarchy of investigated websites are show using our graphical interface; search tools are available to delve down into the structure to find the smallest piece of information. SiteMaps generation and automated investigations are available to help users with dial-up lines and off-hour requirements. Clockz is a unique application that uses our Appbar technology to supply users with the current time in four different time zones. The 3.0 release of Clockz now supports customizable labels for each display and 24-hour formatting on a clock by clock basis. Pocket SharpMT continues to build on the foundation of earlier versions of SharpMT and Pocket SharpMT. This latest release offers better proxy support, more advanced rendering for portrait, landscape, and square devices and streamlining for the 2.0 .NET Compact Framework. Phone SharpMT continues to build on the foundation of earlier versions of SharpMT and Pocket SharpMT. This latest release offers better proxy support, more advanced rendering for portrait, landscape, and square devices and streamlining for the 2.0 .NET Compact Framework. SharpMT is an offline Blog writer that is designed for MovableType based systems. It allows a writer to write a new Blog entry on an offline computer and later upload it to an MT server with one click. SharpMT can also syncronize the list of categories and a cache of previously published posts that are already on the server, offering automated cross-entries links. Pocket SharpMT continues to build on the foundation of earlier versions of SharpMT and Pocket SharpMT. This latest release offers proxy support, better formatting for landscape devices and support for custom tags. SharpKeys is registry hack that is used to manage an internal Windows setting to map one key to another. It uses no extra resources so it loads no drivers, and simply manages an existing function with a convenient UI. Windows 2000 (or newer) and the 1.1 version of the .NET Framework is required!